Currently being offered at Best Buy stores and online for $149.99, the Palm Pre is going to have a special price on Black Friday of $79.99 as part of its Doorbuster specials, starting online on Thursday and beginning at the store at 5am Friday and ending Saturday. According to PR News, each store will have only 5 handsets in stock. Of course, the offer requires your signature on a two year contract. 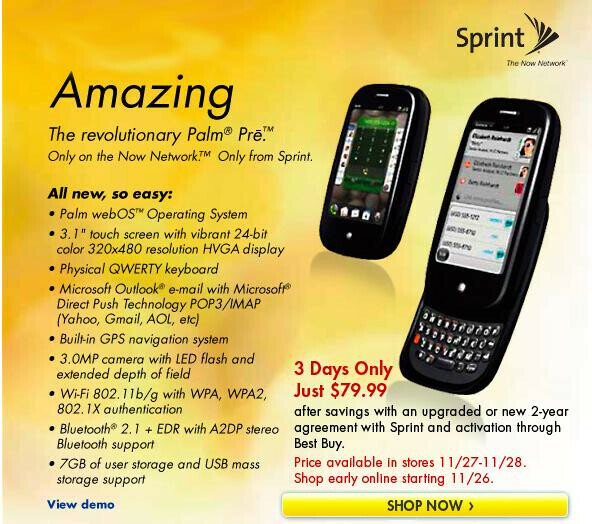 The price will match the current everyday cost of the Palm Pre at Amazon, which just last week-as we reported-cut the price of the webOS device to $79.99 with the activation fee waived and with free FedEx shipping.